"An actual survey of the sea coast...," Cyprian Southack, 1758, Boston Public Library. The Boston Public Library has an impressive collection of digitized maps of the past, stretching centuries before our period of study all the way through today. Among these is a piece by Cyprian Southack that covers the Northeast Atlantic coast of the colonies from New York city to Cape Breton Island. This is a massive map, measuring over 8 feet by about 3.5 feet. 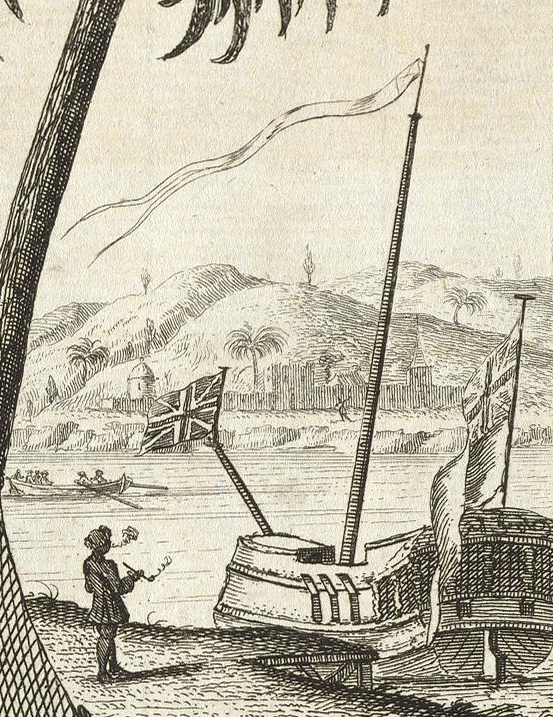 In the upper left corner and just above the key is a beautiful little cartouche, which also gives us a view of a few sailors beside an oddly shaped sloop. Stretching out in the background is a boatfull of passengers (possibly officers) crowded near the cox in the stern. Unfortunately, the figures are so small we really can't say anything about them. The tar on shore we can be a bit more confident with. He wears a short brimmed round hat turned up in the front, a jacket that ends below the waist with a bit of a flair, breeches, and stockings. In truth, I can't be totally certain the smoking chap is a sailor, but the round hat and short jacket suggest it. What do you think?